Good morning everybody! 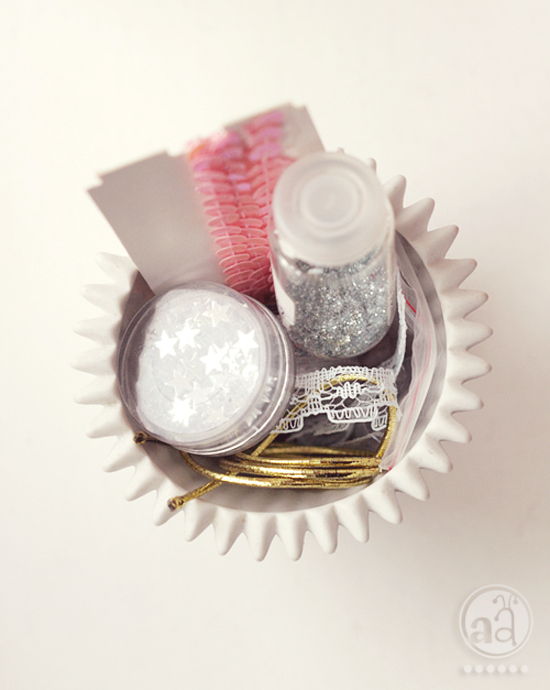 It's time for another crafty tutorial, don't you think? 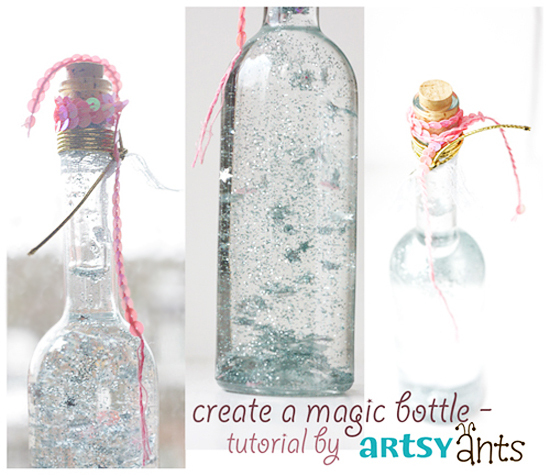 So today, we'd like to share how to make a magic bottle. 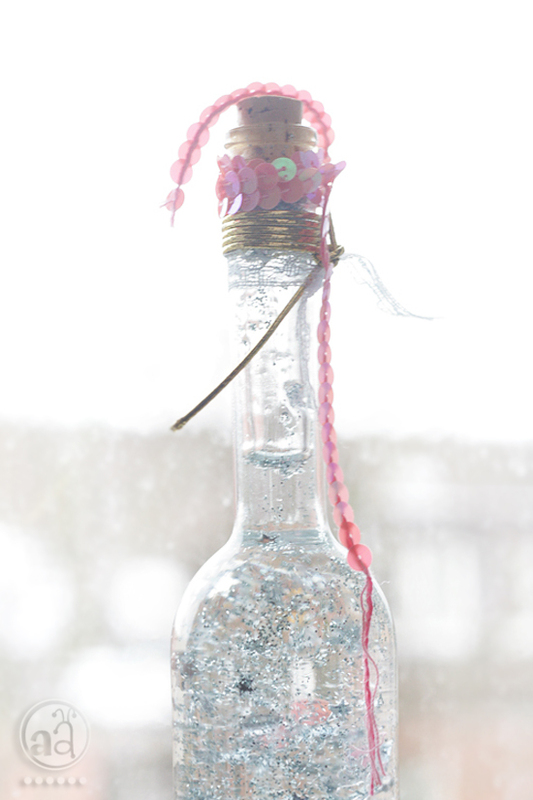 We've shared a tutorial last year about how to make snow domes already, but for those of you who would like something magical on your desk or windowsill all year, why not make a magic bottle? It even involves a few less steps then the snow globes. Plus you don't need to let any glue dry. It's an instant gratification project, and who doesn't love that? So, let's get started! 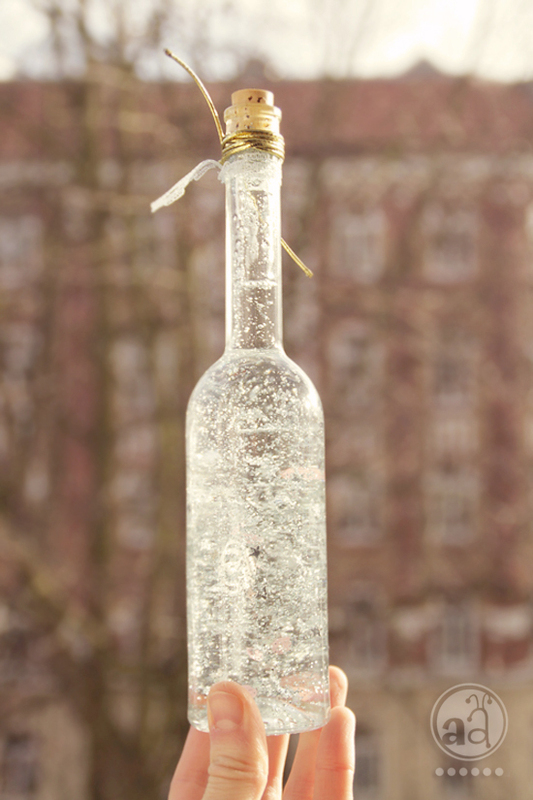 Give the bottle a good shake, hold it against the light or sunshine and enjoy the swirling and twirling and sparkling! Ratio 1:1 means 1 part destilled water, 1 equal part glycerin. So if i.g. you use 1 cup of destilled water, you would need 1 cup of glycerin. The glycerin we used is LIQUID glycerin. You can get it in a pharmacy or check any store that sells beauty products. You will also find it online! That is so pretty! I even have the gylcerin so all I need is the distilled water to make a few here! I have a little girl who is going to be thrilled! Thanks. Your snowdomes were excellent - but this bottle is outstanding. Thank you for the beautiful idea! Ooooh pretty! Now I know why I saved that nice olive-oil bottles (and why I rinced them thourougly and even cooked them clean). I love this idea. It seems like such a quiet-time stimulator! It would be great in a plastic bottle for kids, right? @ daqudoodles: content-wise nothing speaks against using plastic bottles, i'm pretty sure it would work! @anonymous: i'm sure if you used only glycerin the contents would certainly float a lot more. i doubt that you would be able to properly shake the bottle or snow globe though, which is part of all the fun! there are many tutorials around the web that mention nothing of glycerin (or just a dash of it), but i got best results when using it with at least the ratio 1:1.
destilled water (as opposed to regular tap water) is recommended because it stays clear for a lot longer. thank you.. it turned out beautiful! i wrapped it in a big red bow and gave it to my friend for christmas and she loved it! and my moms friend came over and saw it, and now she wants to make one herself! :) thanks for making this and sharing it with us. merry Christmas! I found your blog today and have been reading back through your previous posts and I'm in love. You have such a great blog, and I especially love all your artsy creations. I'll have to try my hand at a few one day. I'm looking forward to seeing more from you. can you add food coloring to it as well? Any advise on wear I could get some of the bottles with corks? How do you think these would look as centerpieces for a reception? 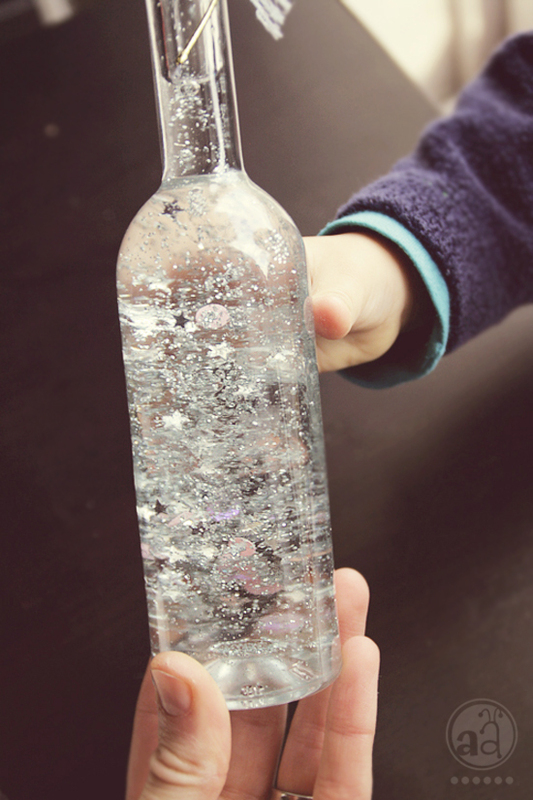 Love this glitter bottle idea..and most all of your ideas..but this one I have everything on hand and will be making some and sharing them with family & friends!!! The glycerin is very liquid... or maybe it is glucose? Why the result is like viscous? The glycerin we used is LIQUID glycerin. You can get it in a pharmacy or check any store that sells beauty products! You will also find it online!